The Priory Building is regularly used by a number of community groups and classes and has been put to a wide variety of one off uses: Burns Suppers, Medieval Banquets, Ceilidhs, Art Exhibitions, Residents' Meetings and Private Parties. The building is permanently heated with underfloor heating and the furnishings are completely fexible allowing for formal or informal seated functions or cleared for a dance or exercise floor. 100 can be seated comfortably in a lecture style arrangement and about 60 for a sit-down meal with a formal table arrangement. There is a separate smaller area set up for serving coffee / tea etc. A 5 metre drop down screen is available for use with your own projection equipment. Wheelchair access and disabled toilet are available and a T loop for the hard of hearing. If you would like to enquire about use of the building and our current rates, please contact Steven: (0131) 331 2128 or email. 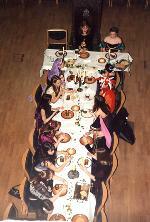 Brownies meet in the Priory on Monday evenings. 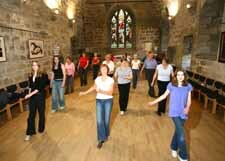 Linedancing classes are held weekly on a Wednesday evening from 6pm. Contact Patrice Reid: 07552131715, or email. The Priory Church operates as a Distribution Centre for this nation-wide initiative, linked to the Trussell Trust. The purpose of the Foodbank is to provide emergency food to anyone experiencing a financial crisis and is open on Thursday mornings between 11.00 and 1pm. You will require a referral form which can be obtained from your local Housing Support Officer. They are available in the Rosebery Hall (01313312213) every Wednesday between 1-3pm and also in Kirkliston library (01315295510) every Tuesday from 1-4pm. Alternatively you can be referred by using your local medical practice or one of the Ministers from the local Churches. The Foodbank is here to help. If you are in genuine need, then we hope you will not hesitate to use us. If you would like to know more or to volunteer, please call into the Priory during Food Bank opening hours. Slimming World hold their sessions in the Priory on Thursday afternoons and evenings and on Friday mornings.